Winning golf tournaments is difficult, despite what Tiger Woods has made it look like for the last fifteen years. Four days of playing against the world’s best on the toughest courses out there explain why a good majority of professional golfers never win a pro tournament. Tommy Gainey won his first PGA Tour event this year at the McGladrey’s at 37 years old, and if you talked to anyone in South Carolina twenty years ago, they would’ve told you that Gainey was destined for greatness as a pro golfer. There are players like Gainey all over the world too, which shows you how good the best players in the world really are. The gap in talent between a player like Gainey and Woods isn’t as big as you’d think, and yet, the difference in the level of success is clearly evident. In golf, much like in every other professional sport, we define a player’s worth by their success. The PGA Tour has been around since 1916, and there have been 107 players to win at least ten events in that time. You may think that’s a huge number, but when you consider the amount of players to come through the tour in the last 96 years, combined with the amount of events each year, it’s really quite miniscule. Jim Furyk currently sits tied for 51st in all-time wins on the PGA Tour with 16, including his one major victory, the 2003 U.S. Open at Olympia Fields. Furyk has never been an electric player. He grinds at tournaments, and plays a solid, consistent game from tee to green. He doesn’t hit the ball long, his 280 yard average off the tee ranked him 171st on tour this year, but he hits plenty of fairways and is considered one of the better putters out there. It’s these characteristics that lead people to believe that Furyk’s game translates well to majors, and that when it comes down to it, he’s less likely to blow up than someone like Woods or Phil Mickelson, who rely more on power and creative shot making. It’s a narrative that sounds like it should make sense, but does it? For roughly the last decade, we’ve been hearing about Furyk’s steely demeanor and his ability as a closer. Of course, that was blown straight to hell this year when Furyk couldn’t close any of the four 54-hole leads he either held on his own, or with someone else. Don’t forget that Furyk was also a major reason for the American collapse at the Ryder Cup, another Sunday where he couldn’t close. Many people suggested that Furyk’s struggles related to him getting older, and as history will tell you, it does get more difficult to hang on to a tournament as you age. However, when you look at the sheer numbers, they suggest that Furyk’s reputation may be a tad inflated. The table below shows all active PGA Tour members with at least ten wins, and their winning percentages when going into the final round of a tournament with either an outright lead, or share of the lead with at least one other player. So, you might be saying “Wait a minute. Those numbers look much worse because of this season. That’s unfair to Furyk.” Granted, his 2012 numbers do take Furyk down a peg, but even if you ignore them, he’s still only 9/17, which gives him a 53% closing percentage. So, why does Furyk get this extra layer of credit when it comes to getting the job done under pressure? He certainly gets far more praise than Stricker or Leonard, who have had similar careers and at least stylistically, have comparable skill sets. 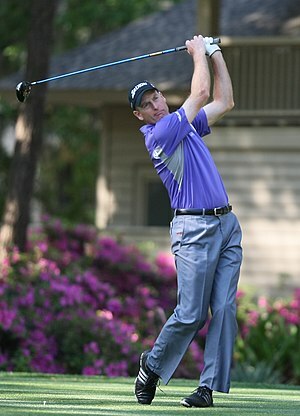 Prior to winning the 2003 U.S. Open, Furyk won seven times. Since winning his first major, he has picked up another eight victories. The one thing that truly stands out is that U.S. Open win, which is one of his nine victories where he went into the final round with at least a share of the lead. He was one of only four players under par that week, finishing at 8-under par, three shots clear of Australia’s Stephen Leaney, and that was the turning point for not only Furyk’s career, but the way that the public and the media viewed him as a player. This is what winning a major does to a player’s reputation. Look at the list of non-name brand golfers who have won their first majors in the years since Furyk won in 2003, and you’ll see a group of players who rightly or wrongly, have been labeled as guys who won’t crack under the pressure of a final round lead. Geoff Ogilvy, Zach Johnson, Y.E. Yang, Louis Oosthuizen, Graeme McDowell and Keegan Bradley are six guys that have been given the Furyk label of a “closer”. Oosthuizen, by the way, has been unable to close three of his five final round leads this season. A lot of this is placed on the American media, who are in love with an American player winning their national open, and to be honest, the same thing would probably happen in the UK if a Brit actually won the Open Championship. Winning a major should provide extra value to a player, but it shouldn’t blind anyone to the actual data behind them. Furyk is one of the finest players of his generation without question, but his career is the prime example of the narrative not matching the numbers. ← Rory McIlroy leaving Titleist; joining Nike next?